GridView TemplateField allow us to specify custom controls, multiple fields and Html using a custom template. TemplateField allows us to define a completely customized template for GridView Column. We can bind the data with in template control using binding expression. ASP.NET provides number of ways to take control over the template control. In this post I am going to discuss how we can set template control visibility based on certain condition which depends on the data source data. For example, imagine you have a link button within template field. You want to set visibility if that control based on the some value of your data source. This might be a very simple and known to most of us, but I found it as a query in a discussion forum of one of my article “Debug your ASP.NET Application while Hosted on IIS” which was published at Code Project . Question was regarding list of worker processes in “Process Attach window” of Visual studio. Though all the sites are running properly on IIS, still he was not able to view any processes in “Attach Process Window” while trying to attach a process from Visual Studio. ASP.NET Session is one of most common state management technique for any ASP.NET Web Application. If you want to do a quick refresh or want to know some thing more, please go ahead and read one of my article “Exploring Session in ASP.NET” published at Code Project. ASP.NET provides several methods for removing Session. But which methods needs to use at what time, is a must known stuff for asp.net developer. In this post I going to talk about bit internals of removing session variables from applications. Why this Post ? I found many people having some confusion around removing / clearing the session variable ( Mainly with Session.Clear(), Session.RemoveAll(), Session.Abandon()) , which method needs to use, what is the purpose of particular method etc. 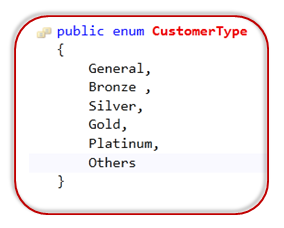 If you have worked with ASP.NET GridView Control you must be aware of GridView.EmptyDataTemplate Property which Gets or sets the user-defined content for the empty data row when a Gri dView control data source has no records. Similarly ShowHeaderWhenEmpty property allows you to show or hide the Header row when there is no records. These are the really good and very frequent required properties. Now, if you are working with the Repeater Control, it doesn’t have any direct features which enables you to set user define content when data source is empty. In this blog post I will discuss how we can create a custom ASP.NET Repeater control with support of EmptyTemplate along with few more important features. Visual Studio has its own integrated ASP.NET Runtime engine, which helps to run any ASP.NET web application with in Visual Studio. While running application from Visual Studio, you must have seen a popup notification in System Tray (As shown in below image) , which is notification of ASP.NET Development Server. WebDev.WebServer20 is targeted to CLR 2.0, which means all the ASP.NET Application which are targeted till FW .NET 3.5 will be taking care by WebDev.WebServer20.EXE and WebDev.WebServer40.EXE for ASP.NET 4.0 based application. Now, let’s see how we can use these executable to run an ASP.NET 4.0 Application with out using Visual Studio. How to make ViewState secure in ASP.NET ? Now let us look at the value. It looks likes an encrypted string. This is nothing but Base64 Encoded string and it is not an encrypted string. So it can be easily decoded. 2. It makes it a little harder to read . But people often get confused that this is an encrypted string. To answer this question In a single statement, you can use HttpContext.Current.Items for very short term storage. By Short term storage means, this data is valid for a single HTTP Request. There are many confusion around regarding storing data in HttpContext.Current.Items and storing data in Session variable. In this blog post I am going to describe what are the different scenarios where we can use HttpContext.Current.Items and what is the exact difference with session variable. Items collections of HttpContext is and IDictionary key-value collections and that are shared across a single HTTPRequest. Yes, HttpContext.Current.Items valid for a single HTTPRequest. Once after processing, server information is sent back to the browser, the variables that were set in the Items collection will lost. Where as for Session Variable, information valid for multiple request as this is user specific. The session variable only expires either on Session Time Out or explicitly clear the values. I have been asked this question many times by different readers of my blog. They wanted to know about the fundamentals of Web Farms and Web Garden. In this blog post, I am going to explain the what is the exact difference between web farm and web garden, what are the advantages and disadvantages of using them. I have also described how to create web garden in the different version of IIS. Visual Studio is having its integrated ASP.NET engine which is used to run the ASP.NET Web application from Visual Studio. ASP.NET Development Server is responsible for executing all the request and response from the client. Now after the end of development, when you want to host the site on some server to allow other peoples to access, the concept of web servers comes in between. A web server is responsible for responding to all the requests that are coming from clients. Below diagram showing the typical deployment structure of an ASP.NET Web application with a single IIS. Clients request for resources and IIS Process the request and send back to clients. If you want to know more details on How IIS Process the request, please read one of my article over “How IIS Process ASP.NET Request ?”. This is the case, where you have only one web server and multiple clients requesting for the resources from the same server. But when there are huge numbers of incoming traffic for your web sites, one standalone server is not sufficient to process the request. You may need to use multiple servers to host the application and divide the traffic among them. This is called “Web Farm.” So when you are hosting your single web site on multiple web server over load balancer called “Web Farm.” Below diagram showing the over all representation of Web Farms. How to remove Hyperlink from ASP.NET TreeView Control Nodes ? ASP.NET Tree view control rendered as HTML Table – TR –TD elements. Each of the node are been represented as hyperlinks. Some times you may not want that fields as hyperlink and you want to be those nodes should be represent as static text. Many of the developer did the same using font style or css style change of the node, but it can be done very easily. In this small blog post I am going to describe how you can represent a tree view node as simple text instead of hyperlink. This can be done very easily using Tree Nodes, SelectionAction properties. SelectionAction having 4 different values, they are. 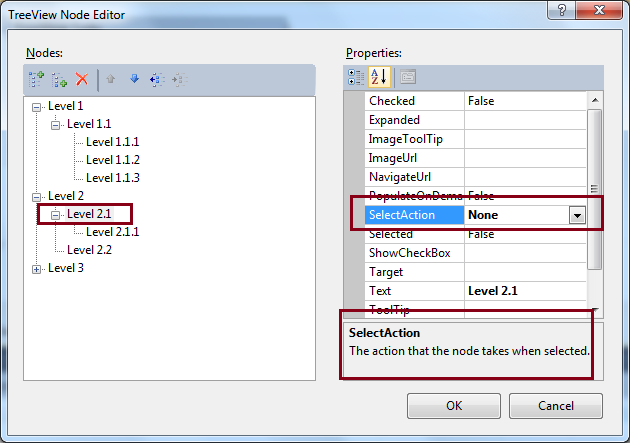 Select is the default option which marked node as hyperlinked and on selection of the node, it raised SelectedNodeChanged event. For Expand Option, TreeNodeExpanded event will be raised while expanding the node. “SelectExpand” raised both the SelectedNodeChanged and TreeNodeExpanded events. Now if you don’t want to make the node as simple text, just change the SelectionAction properties to “None”. 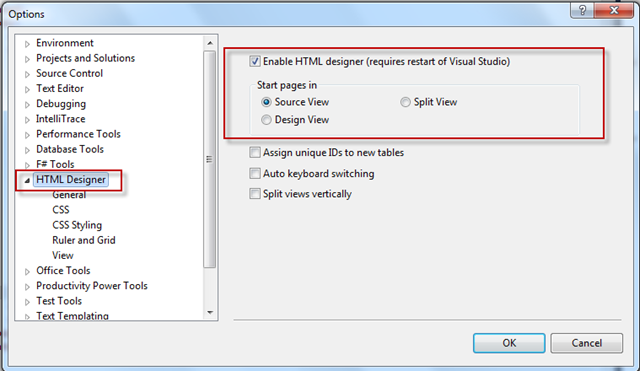 By default in Visual Studio for any web pages design view is the default view. Which may causes some time to load if your page is having many controls . So If you want to change the default view from Design View to Source View, just perform the following steps. Go to “Tools” > “Options” and Navigate to “HTML Designer” Section.